Isabel Wilkerson speaks about race relations throughout American history to a crowd of about 900 people at Evanston Township High School. Wilkerson was the first black woman to win a Pulitzer Prize in American journalism. 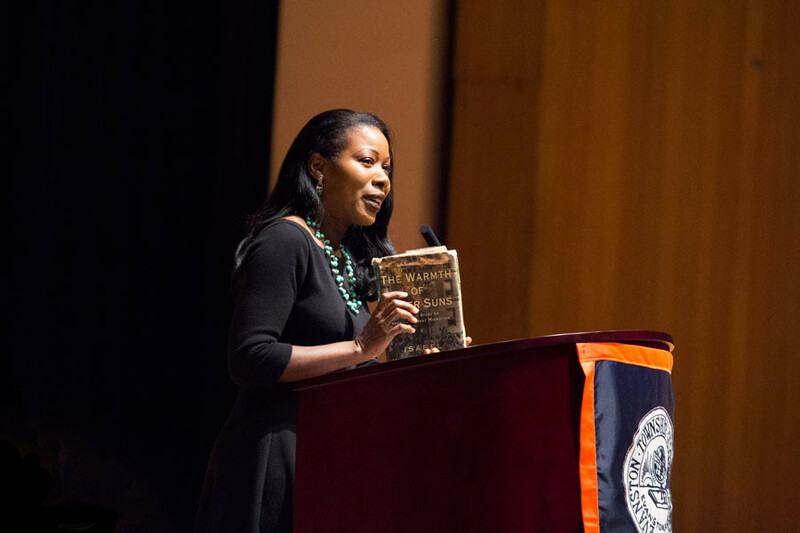 The great American jazz musician Louis Armstrong and award-winning novelist Toni Morrison would not exist if it weren’t for the Great Migration of the 20th century, said Pulitzer Prize-winning journalist Isabel Wilkerson Monday at Evanston Township High School. Wilkerson spoke to more than 900 people about the migration of about six million African-Americans from the South to other regions of the country, as discussed in her New York Times-bestselling book “The Warmth of Other Suns: The Epic Story of America’s Great Migration.” In the early 20th century, millions of African-Americans migrated in hopes of a more equitable life, taking culture and creativity with them, she said. Wilkerson — first African-American woman to win a Pulitzer Prize in journalism — also connected the migration to current issues in police brutality, which she compared to lynching during the 19th and 20th centuries. “The Warmth of Other Suns” took Wilkerson over 15 years to write. Comprised of more than 1,200 interviews with African Americans living across the country, it weaves the stories of three people to tell a larger story of racism and empathy. Wilkerson urged the audience to take action to talk about social justice issues with family and friends, saying that the viral spread of graphic videos of police brutality may have desensitized Americans. “The last hope for us is the uncharted territory of empathy — that is all too lacking,” Wilkerson said. Family Action Network sponsored the event to bring Wilkerson to the high school. ETHS assistant superintendent and principal Marcus Campbell said the organization and other nonprofits helped pay for the speaker, benefiting both Evanston students and residents. Wilkerson also addressed a “caste system” established during the slave trade that exists to this day. This system hurt both the 12 generations of enslaved African Americans and the people that oppressed by wasting potential creativity, she said.